Ghana goes to the polls for presidential and parliamentary elections tomorrow, 7 December for its seventh multi-party ballot since the end of military rule in 1992. The presidential race is expected to be a closely-fought contest between incumbent President John Dramani Mahama and his old opponent, opposition leader Nana Akufo-Addo. Incumbent President Mahama assumed the presidency in July 2012 following the death of former president John Atta Mills. The National Democratic Congress (NDC) party flag bearer then went on to win the December 2012 election beating Akufo-Addo with 50.7 per cent of the vote. Ghana is frequently described as one of the most stable democracies in West Africa and has witnessed several peaceful transfers of power. 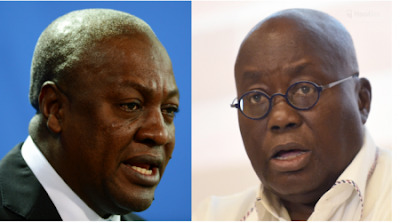 Here are a few things you probably don't know about Ghana elections. 2. Ghana, like the US, has come to have two parties that increasingly split the vote almost exactly in half. Since 1992, Ghanaian politics has been dominated by two major parties – the National Democratic Congress (NDC), the party of the current President and the New Patriotic Party (NPP) who are in opposition. 3. Whenever the Democrats win the US Presidential Elections, the NDC also win in Ghana. And when the Republicans win, so do the NPP. 4. For the first time in Ghana's history, a woman is organising a major election. Charlotte Osei is heading Ghana's Electoral Commission. 5. There has never been a change of government without a second round of presidential elections. This election - that is a tight race between the two main has a real prospect of a second round run-off vote. The trend of elections in Ghana from 1992 to now, reveal that any time an incumbent goes for a second term, the incumbent decreases the percentage of vote they won the first time.